Celebrating a golden birthday calls for a royal celebration! 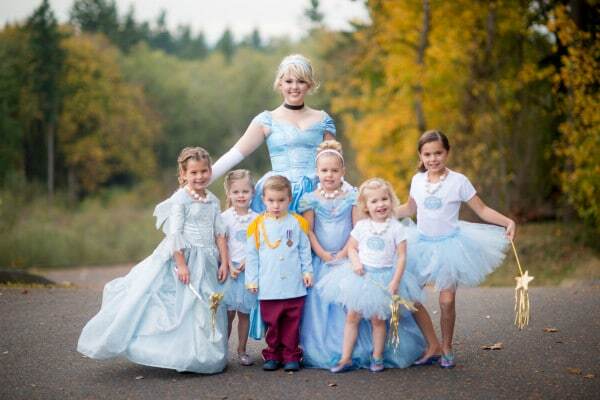 The birthday girl chose a Cinderella Birthday Party theme for her 4th! The celebration that Hoopla Events put together was a dream come true. 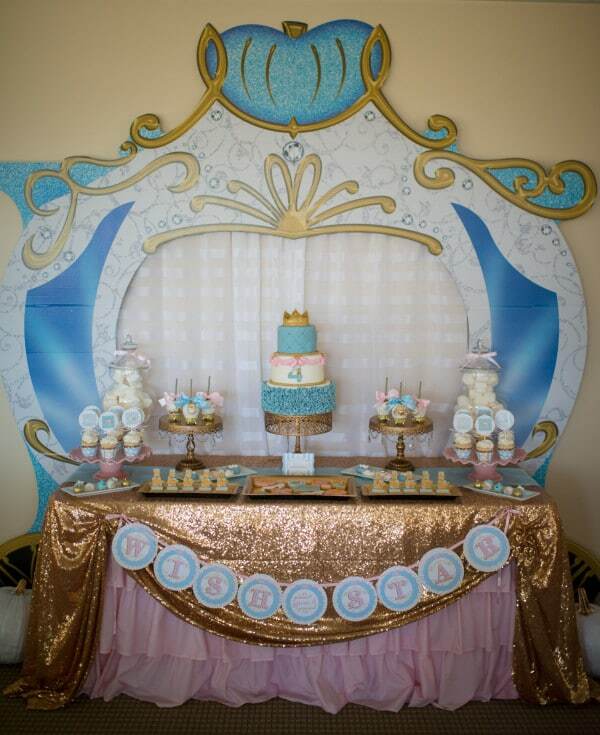 From glitzy and glamorous decorations to the royal treatment at the princess inspired salon to mouth-watering choices at the dessert table, this party was full of magic for the cutest little princess. 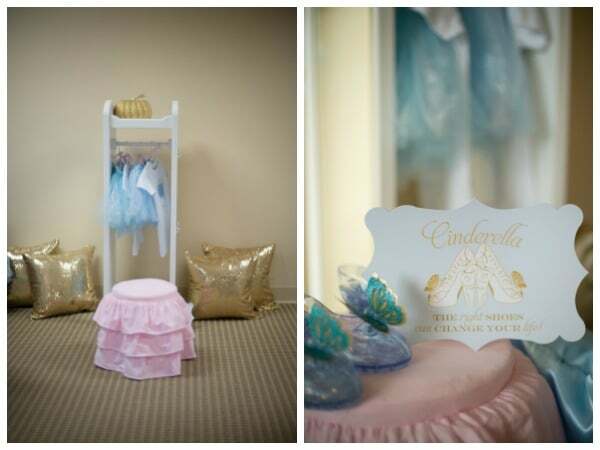 These Cinderella Birthday Party Ideas are sure to impress as you plan your magical celebration for your little one. 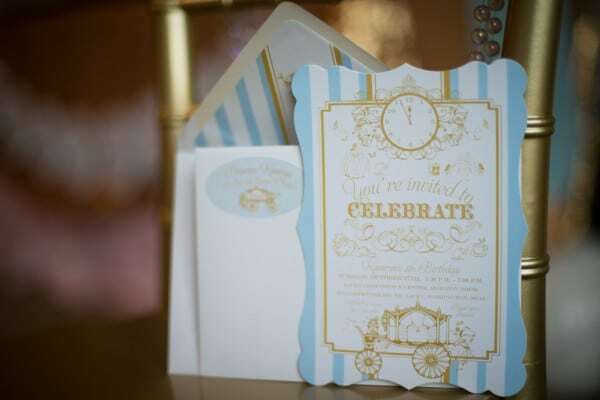 The dream come true celebration began with a beautiful invitation suite from Loralee Lewis. 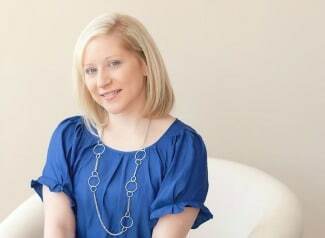 She created all of the beautiful paper elements seen throughout the party! Banner Events came and helped transform the ballroom into a gorgeous setting, befitting of 15 beautiful royal princesses and 1 handsome prince. 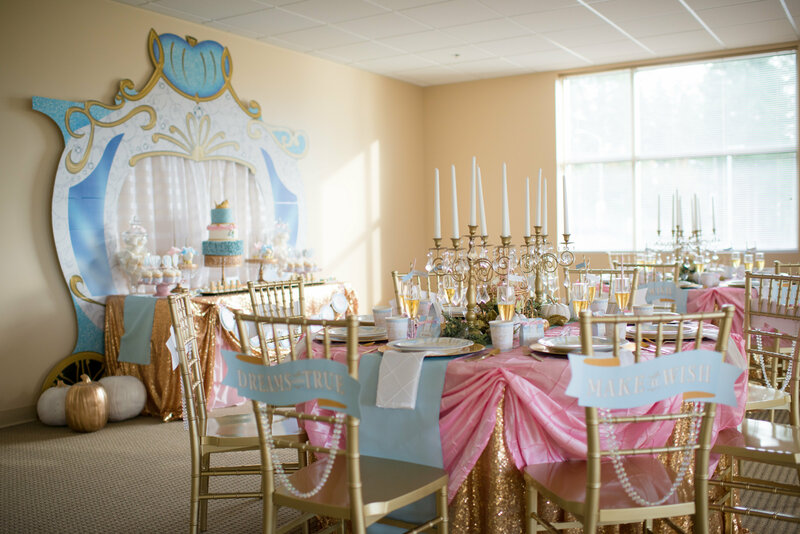 An oversized Cinderella carriage standee from Shindigz provided the backdrop for the beautiful table, filled with delectable desserts. Gorgeous tables were set up with sparkling linens, gold and white painted pumpkins, lovely garlands and gold candelabras. 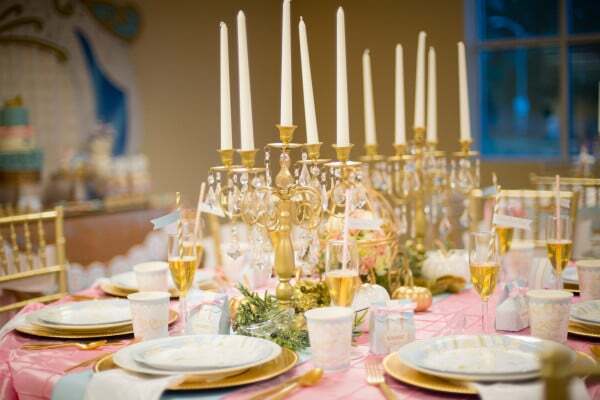 Each place setting was exquisite and included a beaded gold charger, a champagne flute with darling straws and party flags, plus Cinderella themed paper plates and cups. 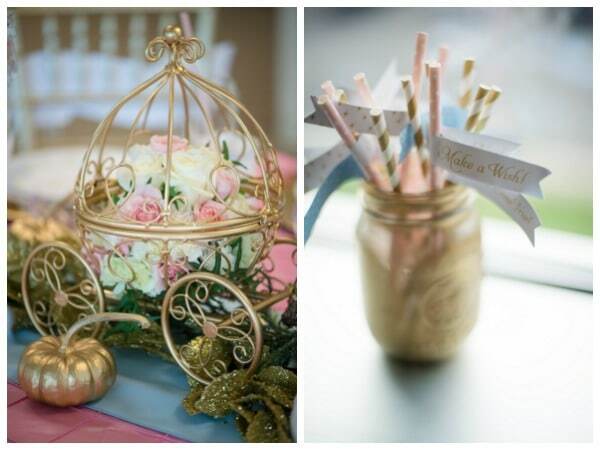 Beautiful florals graced the carriage centerpieces on the table, and there were straws with Make a Wish flags in Cinderella inspired mason jars. 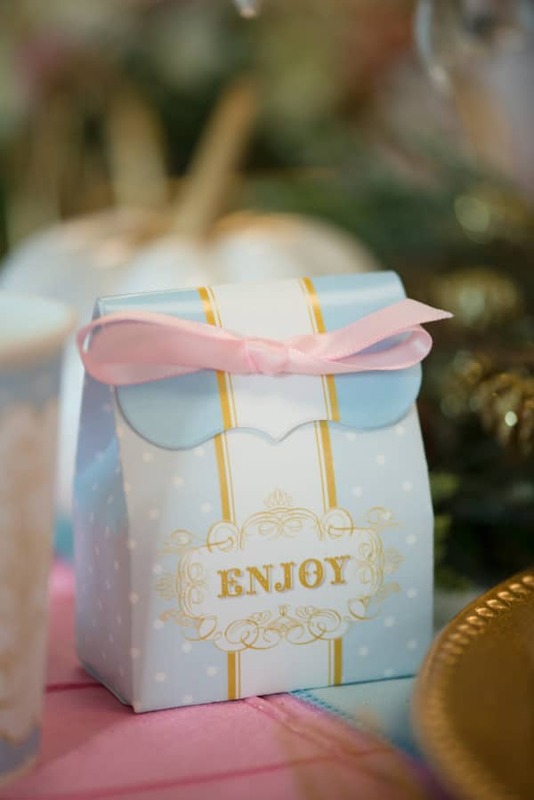 A beautiful coordinating favor bag was filled with chocolates at each plate. Beautiful gold sequin tablecloths provided the foundation for every table at this event. 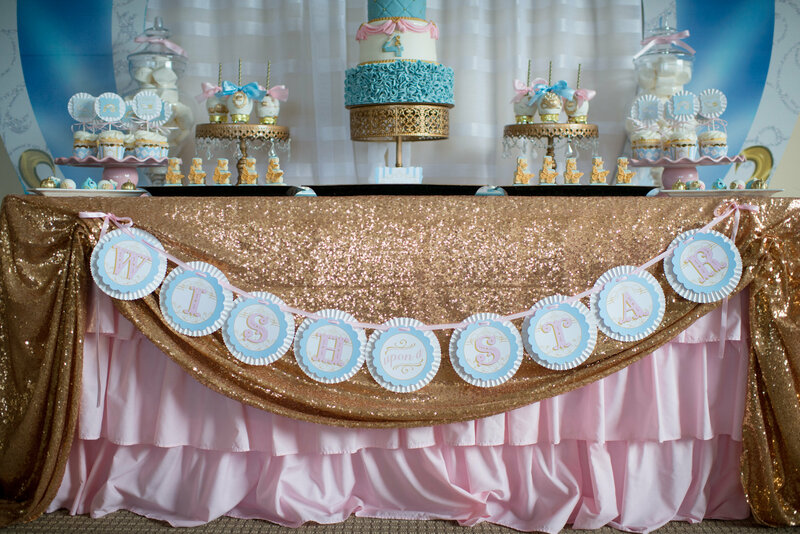 This dessert table is stunning! Front and center, was an absolutely breathtaking 3-tier cake by 4 Kids Cake. The beautiful details made the cake an unbelievable focal point. Cupcakes were topped with lovely toppers and petite pink ribbons and looked unbelievable dressed up in gold princess baking cups. Exquisite caramel apples from Roni’s Sugar Creations looked especially lovely with the gold chocolate detailing! Chocolate covered Oreos are always a hit, and this occasion was no exception. 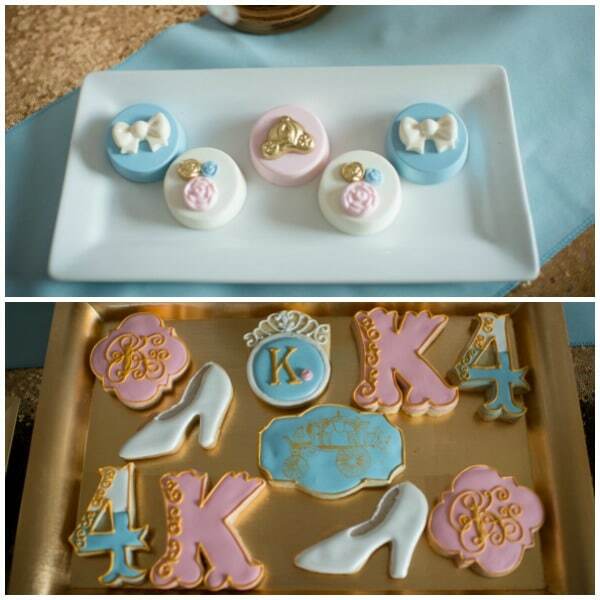 Bella’s Bakery & Bowtique made custom Oreos to match our theme! Always a favorite, decorated sugar cookies by The Sugar Canvas Boutique Bakery were incredible! From cookie sugar towers accented with butterflies to gorgeous shaped designs, guests couldn’t stop talking about how delicious they were! 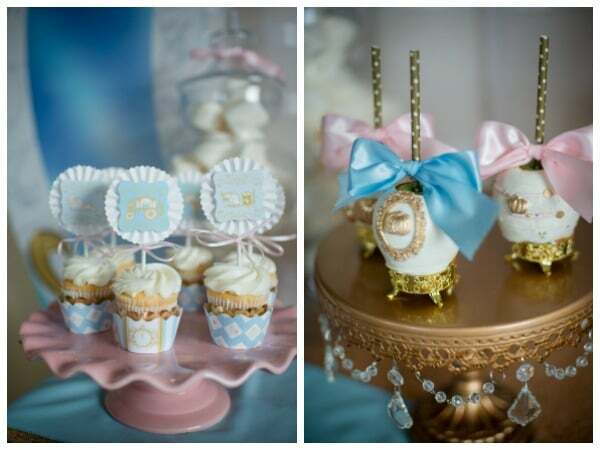 Vy Passetti Cake Pops sent along beautiful Cinderella inspired cake balls. Guests were blown away by the gold pumpkins and carriages. Once guests arrived, they were whisked away to get dressed in their royal attire. 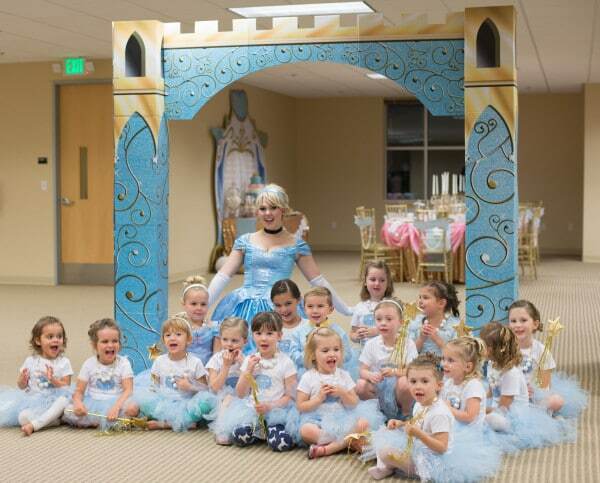 More than a dozen princesses received gorgeous glittered tutus from Tutu-rella’s and lovely custom appliqued carriage shirts from Great Stitch. Dress-up shoes and gold wands completed the outfits. 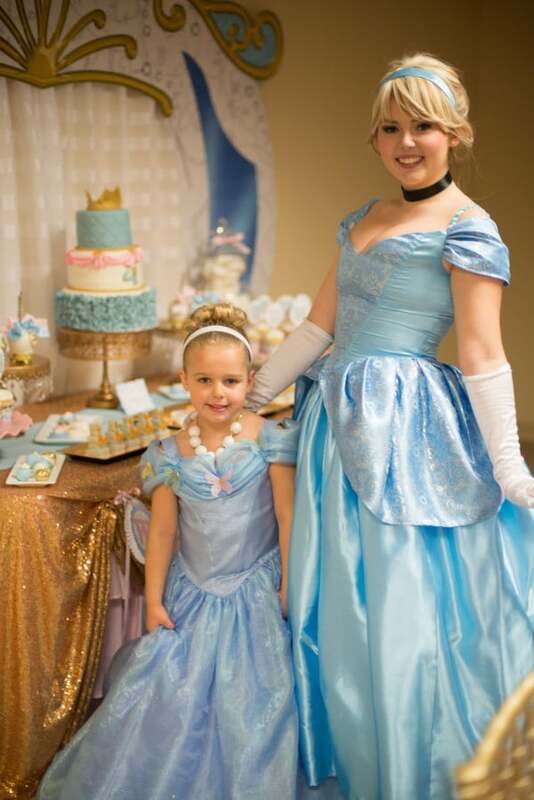 The guest of honor, Kamryn, was outfitted in a beautiful Cinderella dress and glass slippers. Prince Charming was also dressed for the ball, wearing a royal suit and an appliqued undershirt. 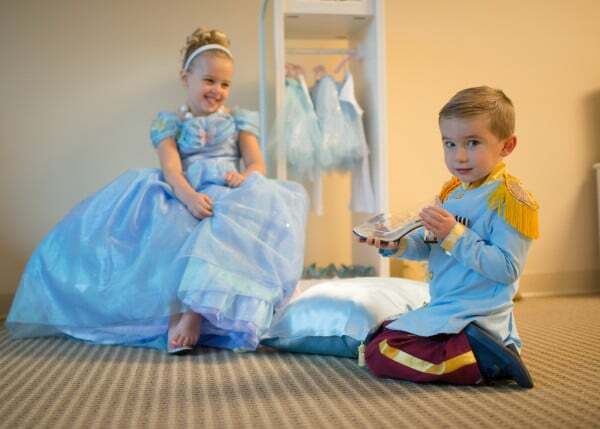 He loved the attention he received as he tried fitting the glass slipper on pretty princesses. But alas, only one princess was meant for this shoe! Once dressed, the princesses received the royal treatment in the spa area of the party. 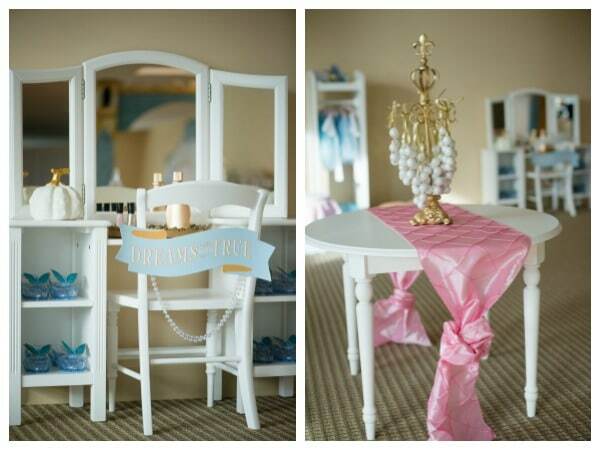 Sweet play vanities, tables and chairs were transformed into lovely spa stations. A mirrored vanity tray was set up with fingernail polish remover and pink, gold and blue polish. 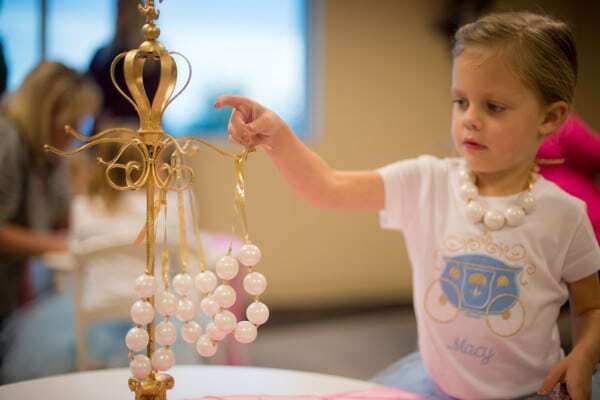 The final touch was choosing a beautiful gumball necklace by Mammarella’s Sweets & Treats to accent their outfits. A real live princess at the party, what is better than that?! 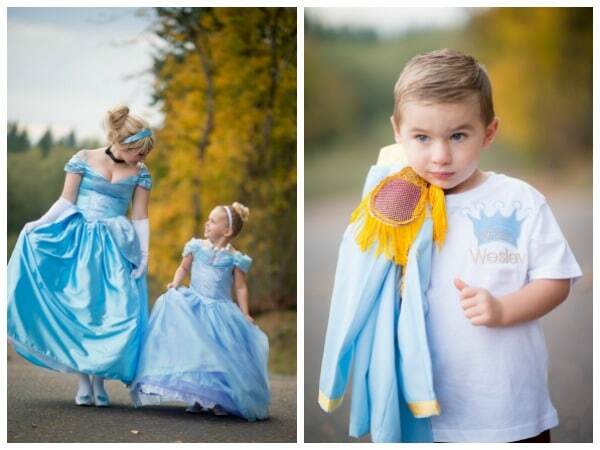 I bet the birthday girl loved all her pictures with Cinderella! Wesley’s appliqued undershirt is the sweetest thing. 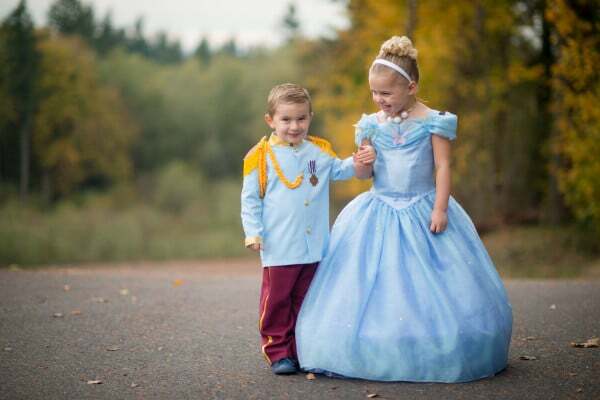 Cinderella with her Prince Charming … they are so sweet. The royal guests loved photo ops with Cinderella! The birthday girl’s older sister was transformed into the Fairy Godmother, complete with silver glitter shoes and a magic wand! Truly, this was an occasion not to be forgotten. Never stop dreaming little princesses! And keep wishing upon the stars. 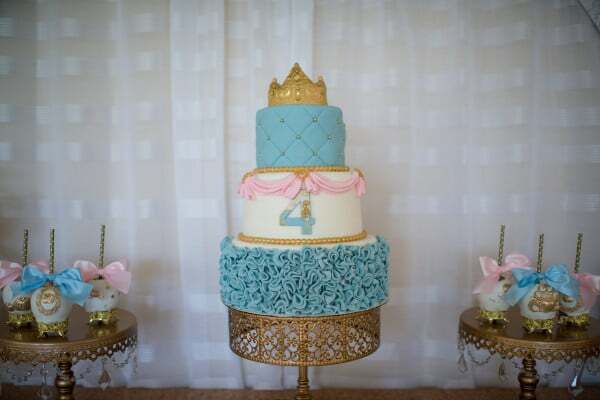 What’s your favorite Cinderella Birthday Party Idea? Let us know in the comments below. 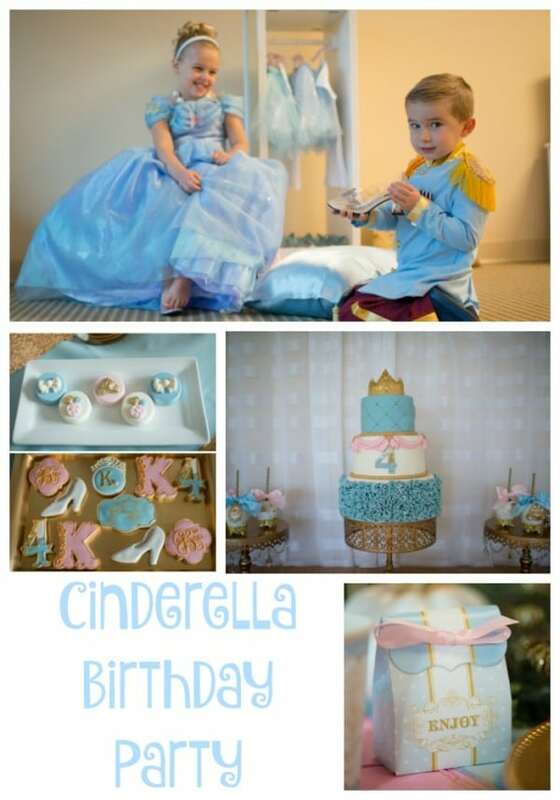 Plan the perfect Cinderella Birthday Party with these fun party products! 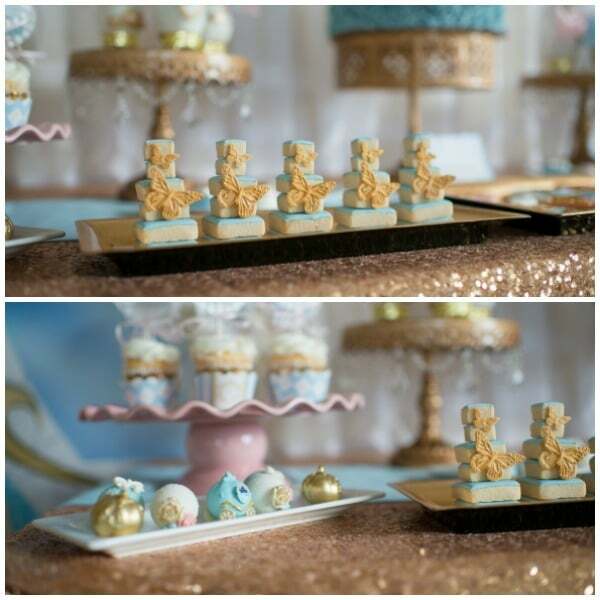 Check out these other Cinderella features on Pretty My Party!